Well, I was just playing around with Sepia on this picture I took in Pennsylvania on my drive across the country. I have a friend that likes barns and paints them, so I thought this was appropriate for her. Now dont tease me about the crooked barn thats on the slanted hill. Tell me what you think of the coloring and the photo in general. wow, it looks good enough to live in!! anyway, i think the subject is very well suited to sepia. it would also make a good painting!! Look........you can't join TIFF and tell us what we can't do......that spoils the fun! See...... it's doesn't work now! Seriously, I like the comp, though I would personally crop some of the 'dead space' i.e. to the left. The idea of sepia works well but using PSP (I think thats what you use) try going to 80 years of age to really boost the age and colour. It might just make the whole photo "Pop" a little bit. I would love to have a day touring your areas, these barns in the middle of no-where fasinate me. In the UK all we get a small shed big enough for one person stuck in a ditch! if the slant is bothering you you could straighten the photo up i love the sepia these kind of barns suit it so well, i would also go 'older' if you can nice job! I'm in love with this barn Ann. I agree that making it a bit darker sepia would add character to it. I haven't seen a barn that lovely in years. I like it in the sepia, but I agree with John about boosting it some. Do you have any plugins in your PSP ?? This is lovely in Sepia. I bought a very large book about 30 years ago, all paintings and writings of a painter who spent about 20 years travelling all round just to do this. 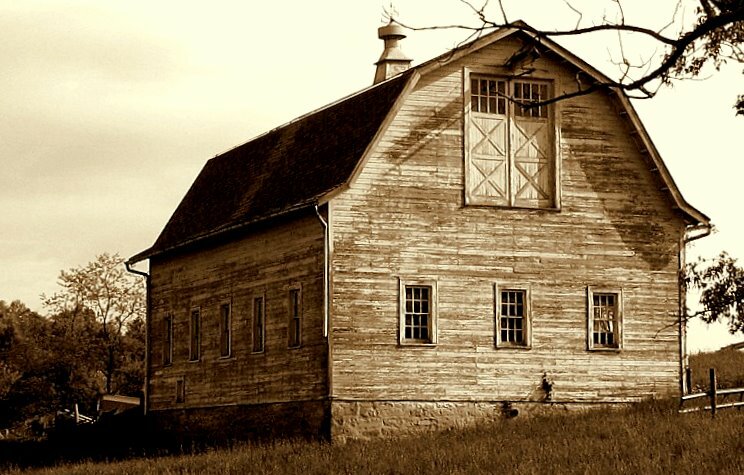 This is a very pretty pic...I love to photograph old abandoned buildings too!!! Nicely done! Love the barn. I'm not big in sepia but it does well for this shot. Hope you don't mind I downloaded the file and dinked with it a little. I recropped it, put the branch is the upper right corner and the end of the shadow in the lower right, cut out a little of the grass and the blank sky. I tried to move the barn itself a little off center in the picture and if there had been more picture to the left I probably would have offset it even more. Made the color temp a little warmer and sharpened the image. I really like the "pencil effect"
I think cloning out the branch was a good idea too. looking a the picture with the branch, it draws your eye from the barn. you boys like to fiddle don't you!!!! i have to say that i get as much fun playing with my photos in photoshop afterwards (almost) as taking them in the first place!! both of your edits are great!!!! By the way, Ive been gone since Wednesday, so its my first opportunity to peek at what you did...John & Grizz. No problem... I love what you have done with the picture...I wasnt sure how much to crop, as well as I notice that you took off some of the leaves as well as some branches, gave it darkened the shadows. It placed the time of season as the fall...opposed to the spring. I like the pencil effect alot; however, I prefer my branch off to the side...dating it back to the fall...as Grizz did. But is probably appropriate to for the art effect. The darker sepia looks much better. Since this is my first attempt with Sepia...I wasnt quite sure how dark the standard usually is. This was a great lesson on what one can do to date the picture! By the way... I left a lovely company in Virginia to come back to Oregon, and my boss gave me a $400.00 going away gift. This picture will be her thank you for being supportive. Now you all have given me great ideas on how I want to complete this little project. 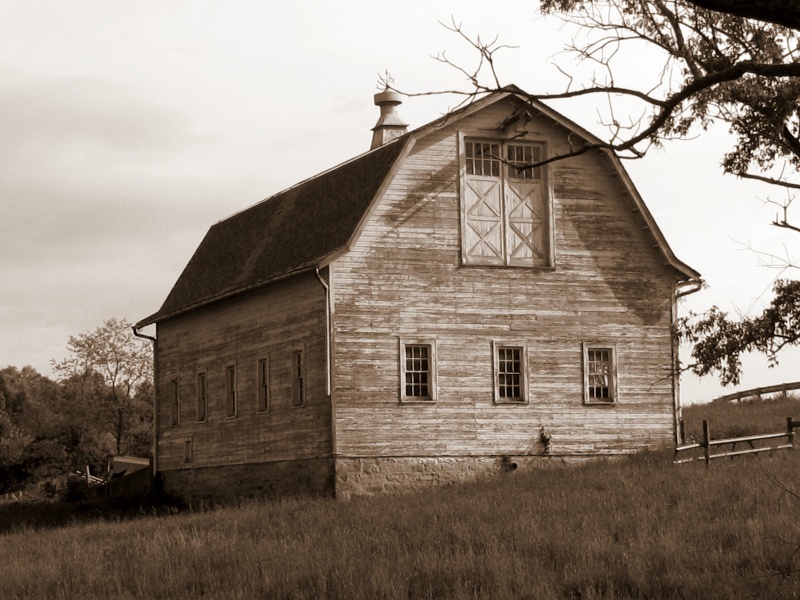 If anything else, she could also draw her redition of the barn once she gets the photo! John will LOVE what you did! I found it most impressive. It did a lot for the barn to clone the tree out and using the pencil in PSP-XI was great I seldom think about that. I can't wait for her to see it...she's been out of town.